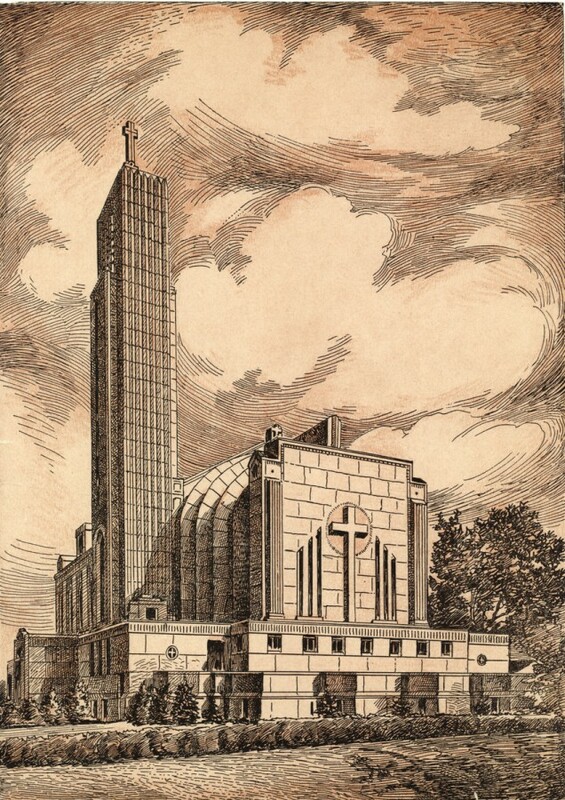 This week’s installment of Flashback Friday brings us to a rare type of architecture: ecclesiastical Art Deco. 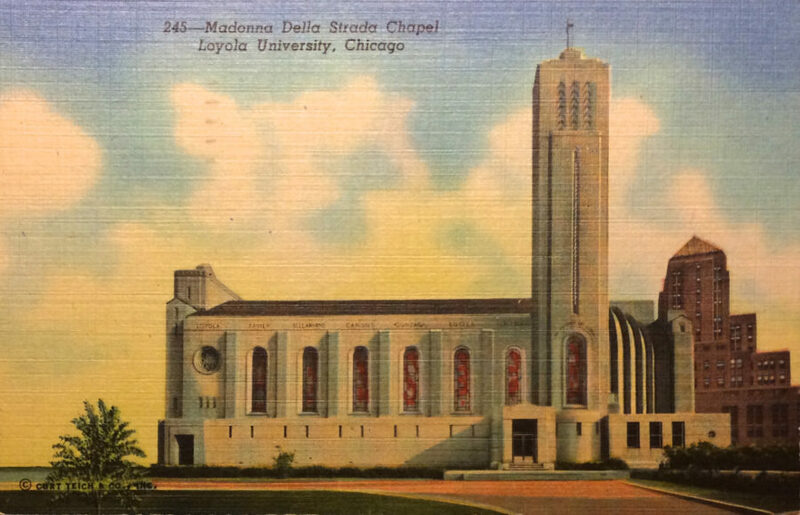 The Madaonna della Strada Chapel is a unique cultural icon on Loyola campus, with its front door on the lake. The beautiful view outside of the sanctuary was planned to be much different than what exists today. 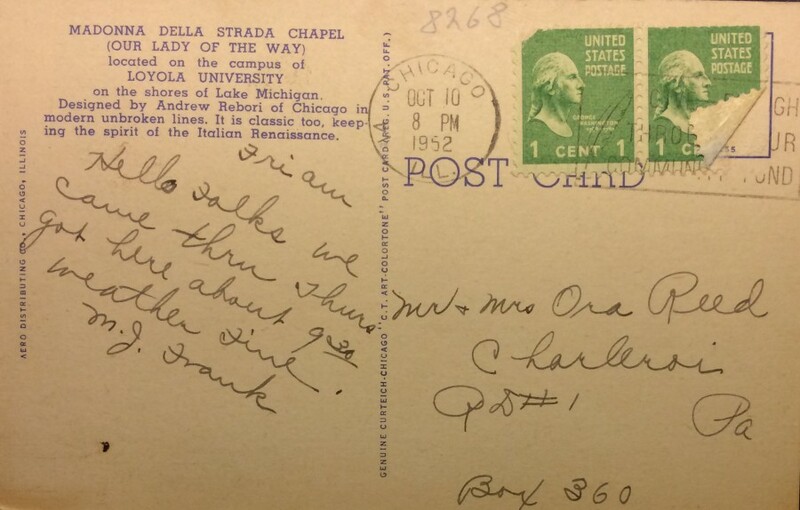 The sender of this postcard arrived on campus in October of 1952, which would have been a lovely time to see a recently constructed grand church overlooking the lake. In 1922, Fr. James J. Mertz arrived at the new Rogers Park campus of Loyola University to teach at the new College of Arts and Sciences. He had previously taught Latin and Greek at St. Ignatius High School, a related Jesuit institution in Chicago. There was no place of worship on the new North Side campus, and Mertz began a tireless campaign to have one built. 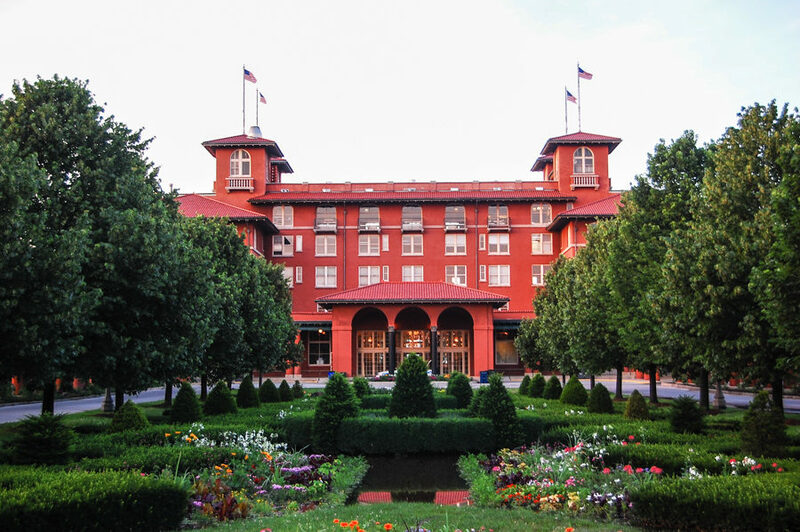 From the years of 1924-1939, he worked to raise $750,000 for construction costs. This was an impressive accomplishment during the height of the Great Depression. In 1929, Andrew Rebori created the spectacular Art Deco design we have today. 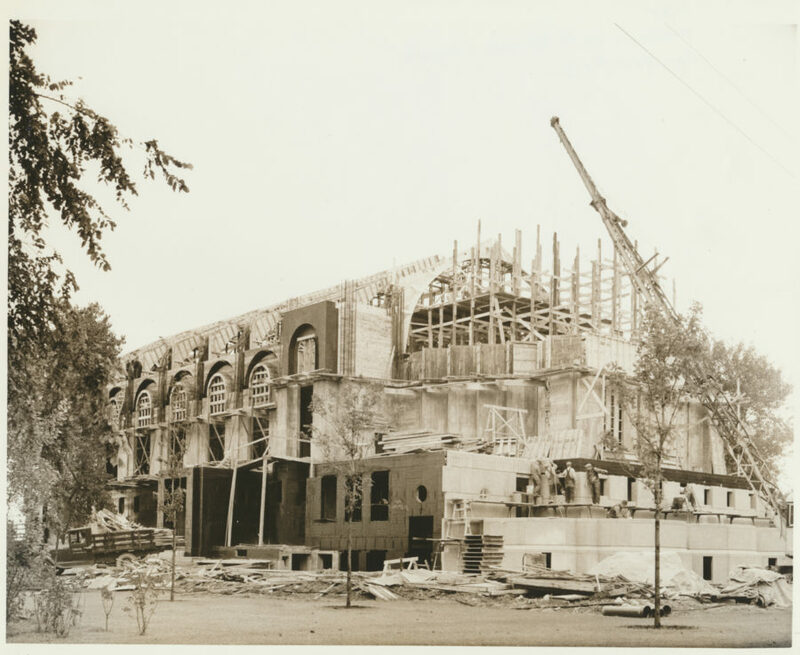 After 15 years of fundraising, construction began on the new chapel in 1938. 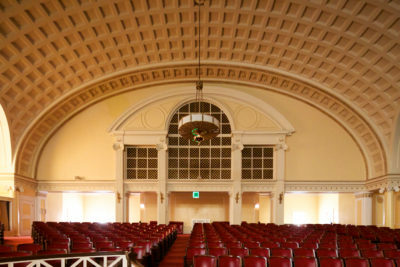 The chapel opened for worship in 1943, but not all aspects of the design were complete. The walls were plastered and and flooring finished in 1948, years after initially opening for services. The “Madonna della Strada” — the Madonna of the “Way” or of the “Road” (la strada) —- is the patroness of the Jesuit order. A reproduction of the painting of this Madonna in the Church of the Gesù in Rome is displayed in Loyola’s chapel. However, the name has a more particular significance. In the 1930s, Lake Shore Drive was being extended northward — by 1933, it had reached Foster Avenue. Had money not run out during the Great Depression, plans to extend it further north might have been realized around the time that Madonna della Strada was completed. 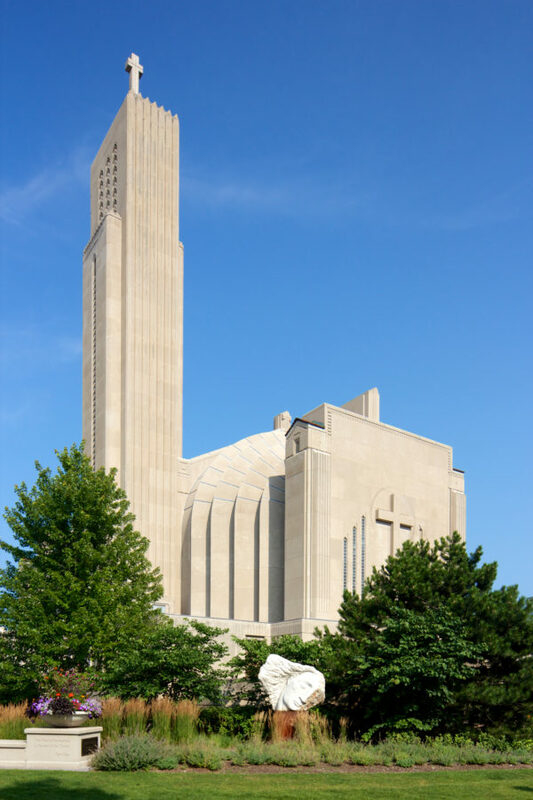 The church is designed so that its front door would open out on to the Lake Drive — and its patroness, the “Madonna of the Roadway” — would look over the cars on the route. 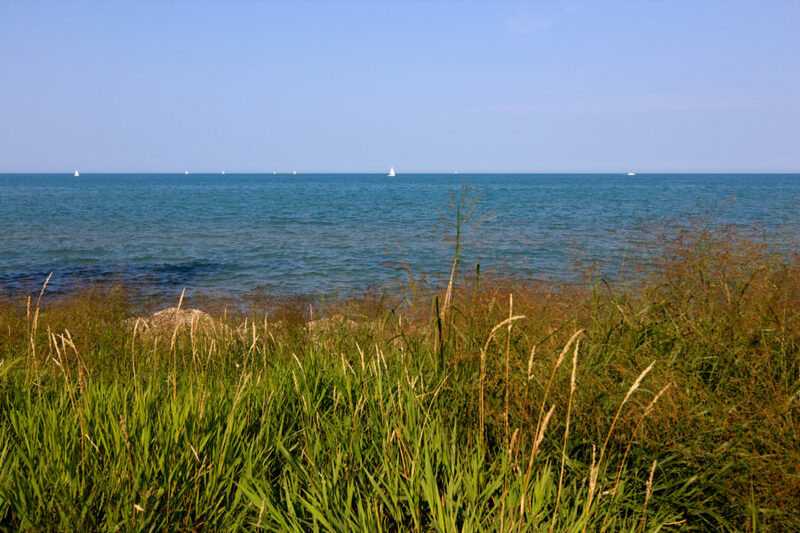 However, the Lake Drive was never extended past its 1957 terminus at Hollywood — and so Madonna della Strada’s front doors open on to the shore of Lake Michigan. 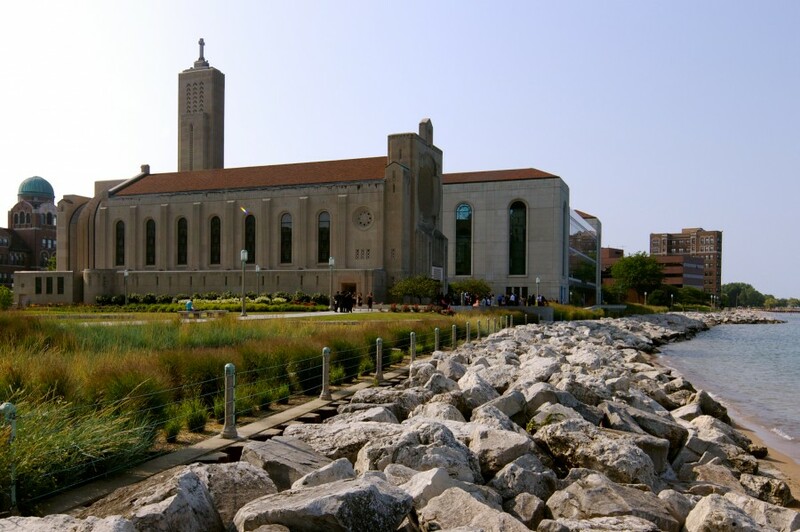 Fortunately, we don’t have a multiple lane Lake Shore Drive separating this architectural treasure from the shoreline. Instead, it’s a quiet path and resting area for worshippers, wedding participants and guests, students, and neighborhood residents. Art Deco architecture emphasizes geometric form, organic shapes, and animals. The entrance overlooking the lake is all of this and more. The Four Evangelists aligned with the corners of the Chapel’s front are a dramatic punctuation to the entrance. Renovations in 2006-2007 replaced the early 1980s gray tile floor with Italian marble, and a new baptismal font, altar, and tabernacle were added. Also part of the renovation were the addition of plaster arches stretching across the ceiling. 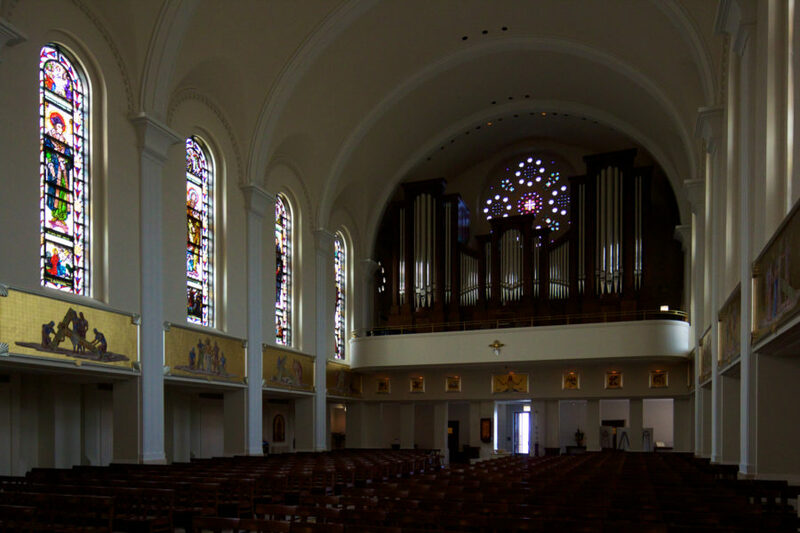 The renovation also saw the installation of a the Katheryn “Kay” Stamm Memorial Organ, Goulding and Wood Opus 47. It’s visible in the upper level of the photo above, and a time lapse video of its installation was recorded during construction. 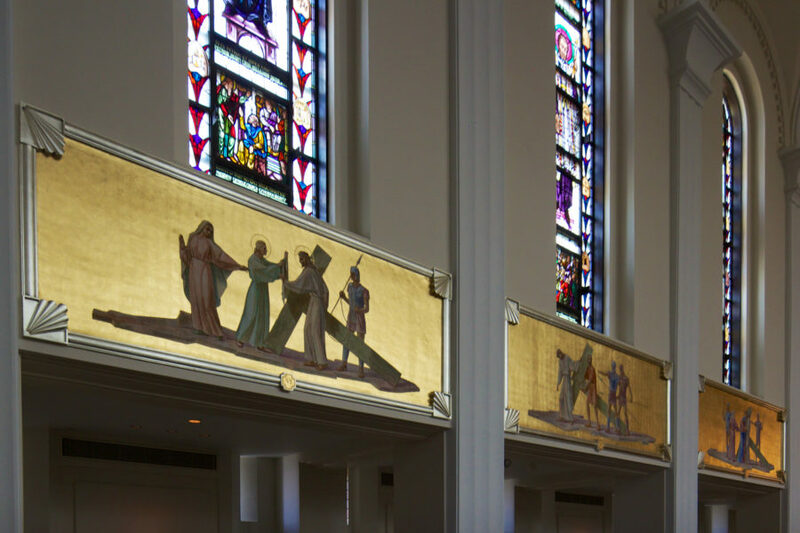 Also part of the renovation was the addition of gold leaf to the stations of the cross. 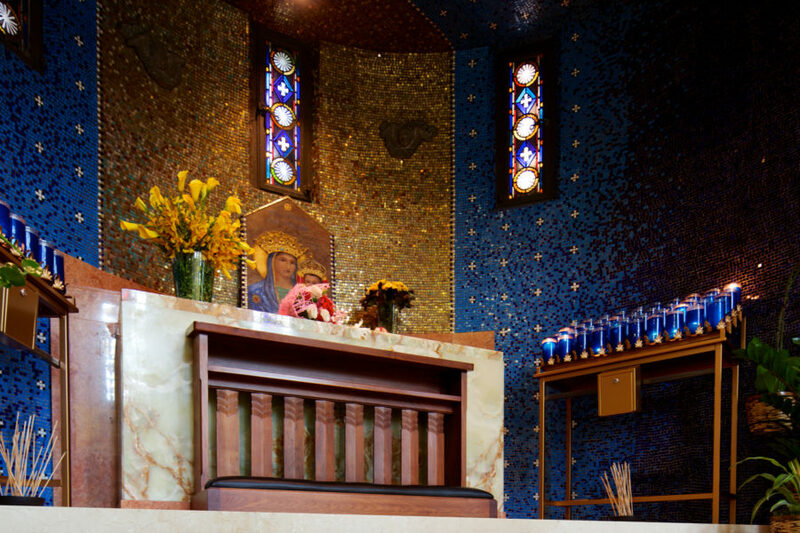 Madonna della Strada Chapel occupies a special place in the crowded world of architectural marvels in the city of Chicago. It has unique design, successfully completed fundraising and construction during the most challenging of times, and underwent careful and thoughtful recent renovation. The chapel isn’t a lone bird for this streamlined and geometric design. 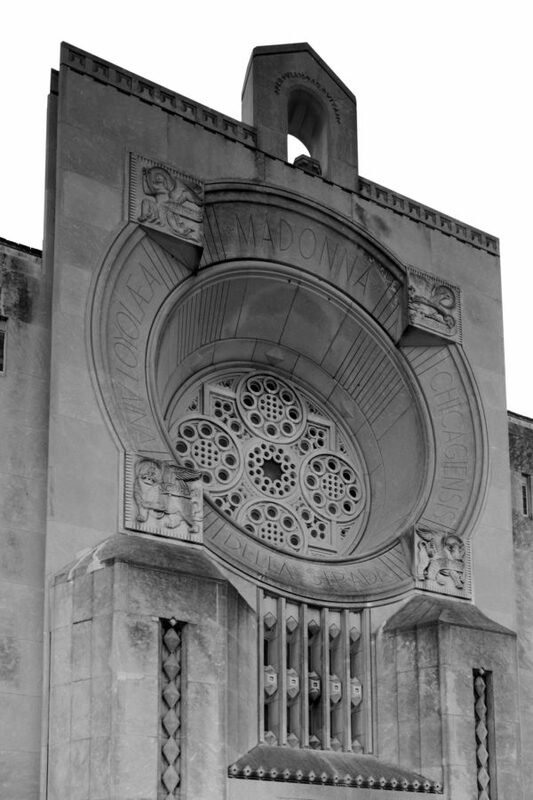 Visible in the right of the image above Mundelein College skyscraper, built in 1929, the same time Madonna della Strada was designed. 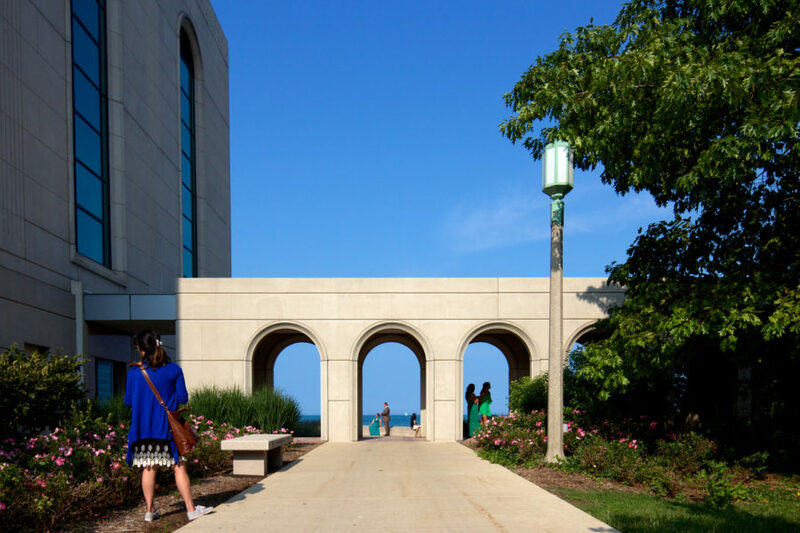 Mundelein was the last private Catholic college for women in Illinois until 1991, when it affiliated with Loyola University. 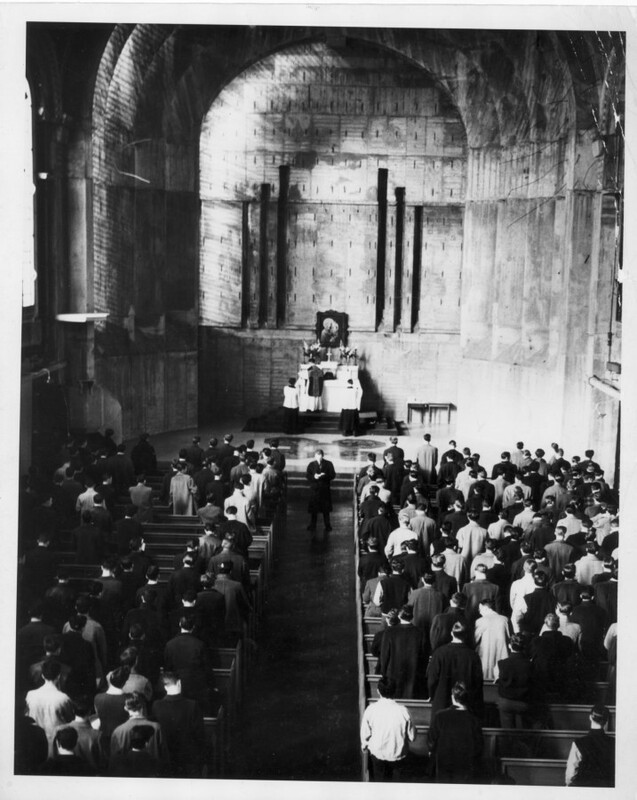 This November marks the 75th anniversary of the Chapel’s dedication. 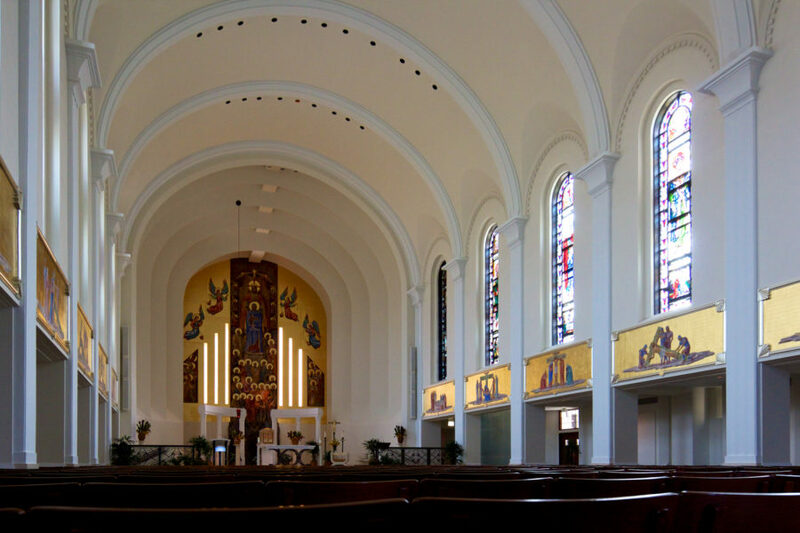 To celebrate this important milestone, the University is embarking on a campaign to complete the final design of the chapel that Father James Mertz, S.J., a key visionary in the original construction, had envisioned. Madonna della Strada was constructed throughout the Great Depression, and successfully completed as a result of generous gifts from our community members. Funding for the final phase—the completion of the bell tower and bell installation—was never concluded due to the economic hardship of this time in history. 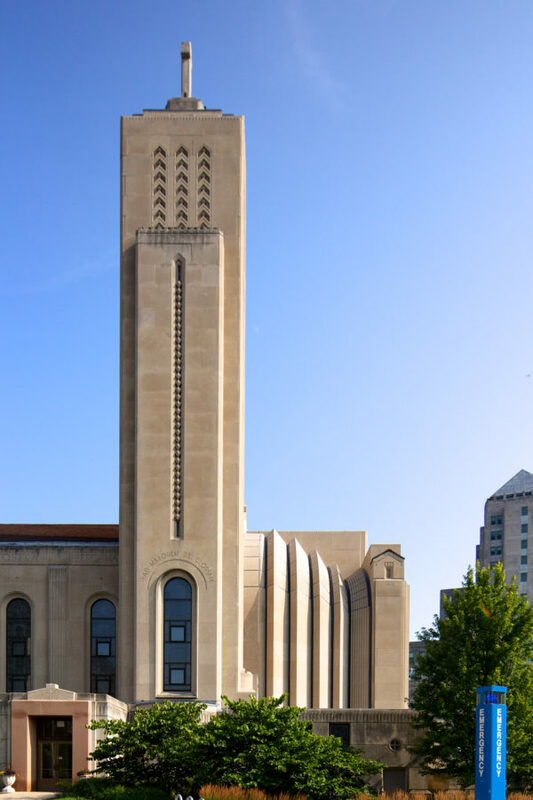 Today, after months of careful research, Loyola has determined that the existing tower can accommodate a set of four cast bells and our community has the unique opportunity to be part of realizing Father Mertz’s vision. It is a pleasure to share that funding for three out of the four bells is committed! We are now coming to you, in the spirit of generosity for the original plans for the Chapel, to ask you to consider making a financial commitment to fund the final bell, the James bell, in honor and memory of Father Mertz. Our goal is to raise $50,000 between now and October 1st, 2014 for this important anniversary project. At the close of the campaign, we will celebrate with a blessing for the bells before we install them in time for the Christmas season. The chapel and surrounding architecture is easily accessible via the CTA Red Line. Take a trip to soak in one of the loveliest university landscapes in the city and one of its finest examples of ecclesiastical architecture.